Seawalker was set up in the year of 2000. 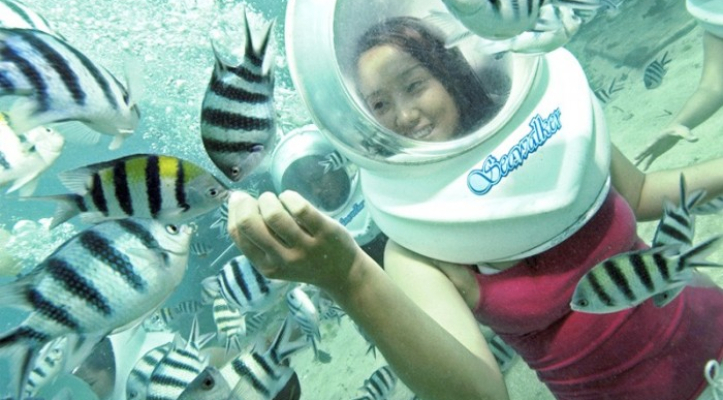 Club Aqua warranty your safety during the Seawalker activity, as its unique helmet design enable you to breath underwater normally or the same way as your breath on the surface. The helmet was originally design and manufactured in Japan, the Seawalker home base. Get free documentation of this amazing experience in one piece photo. It was simply wonderful. 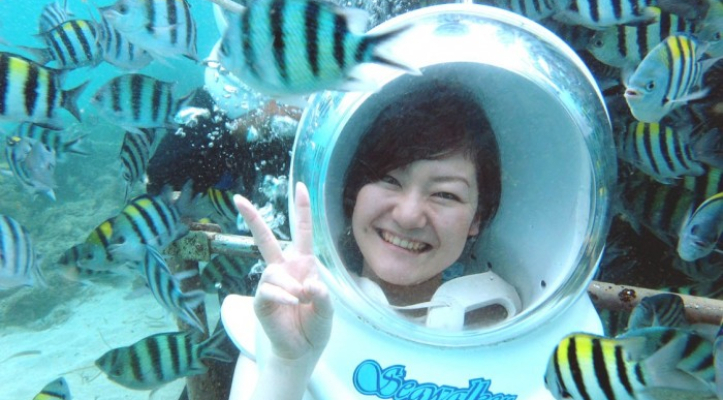 My wife went underwater but I couldn't due to air pressure in ear was too much. The underwater shoes can be better because I had to wear the one which had algae on it. And after the tour I had to wait about half an hour for photo ONLY because there was a confusion between vendor and staff here about the free photo option when we had paid for it. But over all the entire program right from pick up to drop was superb. The pick-up was on point and very pleasant, but after that the organization of the whole event isn't that correct. After the left over at some hotel we have to wait in the lobby for 15 minutes, then go in the front and wait another 15 minutes for a group, but in fact went with 4 people instead of 6. Then after that, of course, as many have written - it's not 30 minutes, was around 10 or 15 minutes underwater (which is enough for some people, but it is advertised that it is 30 minutes, one of the guys there even wore a t-shirt that said that). The adventure itself is really nice, but the staff isn't that much which makes it a bit less entertaining and fun. The biggest issue that we had was with the photos - first of all their quality isn't that great which is fine, but the worst thing is that they make like 25 photos of you and then the package includes JUST ONE of those photos. This is absurd to be honest, you ask for additional payment per each photo. We were a couple and we had to choose only 2 images although we had images on our own and together. Then you gave us these images on a CD...one image on a single CD is a waste of the CD storage if you ask me. We had a wonderful experience. 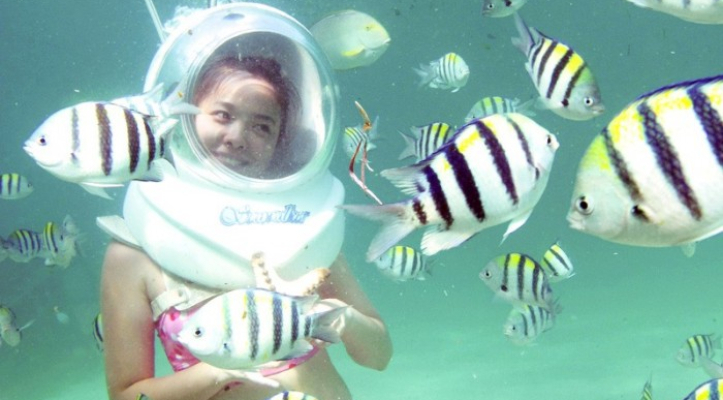 It is great for first timers and for those scared of underwater activities. The pick-up from our villa was half an hour late but the experience made up for it!. We could not see very far underwater as it was rather muddy on the seabed but once the fishes come for the food, you can see lots of colourful fishes swimming around you. 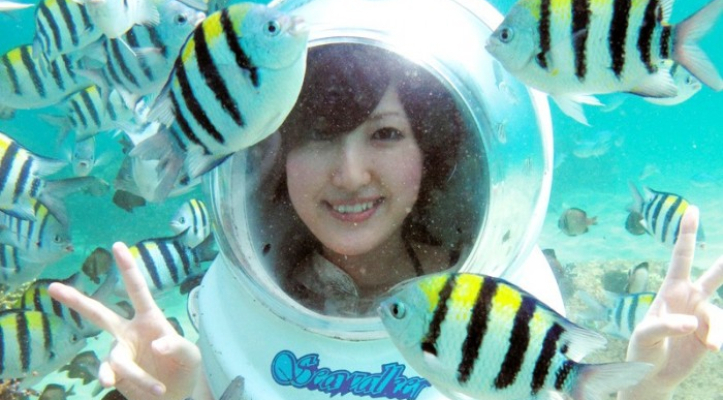 It is quite an experience to feed fish food to the fishes from your fingers instead of the bottle. The guides are always there if you need assistance. 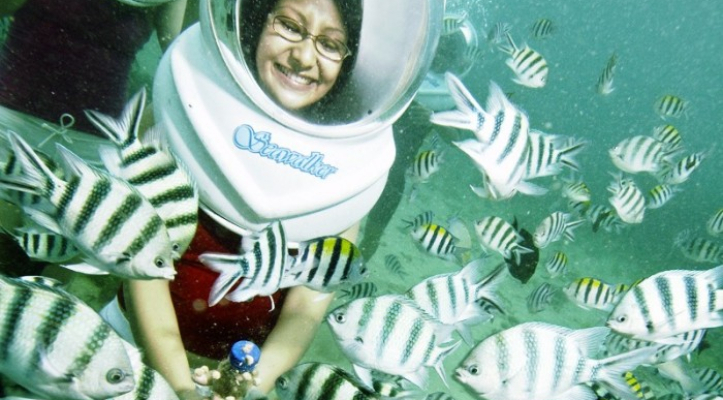 A must do activity in Bali!